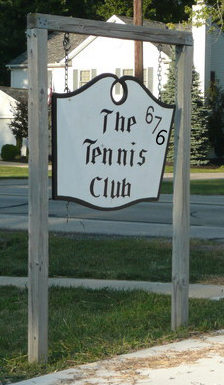 The Tennis Club is located at 676 Avon-Belden Road (Rt. 83), just north of Pin Oak Parkway. The club's sign is at the foot of our long driveway, which is next door to a small office building where the License Bureau is located. Above: The Tennis Club sits behind a small office building where the Ohio License Bureau is located. Above shows the driveway leading back to the courts. Left: The sign at the end of the driveway.